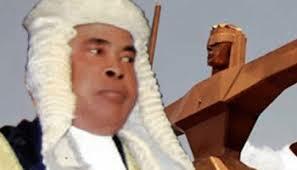 Home Nigerian News Justice Ngwuta Earns N 24m annually , Spent N 500m in 10 Months. Justice Ngwuta Earns N 24m annually , Spent N 500m in 10 Months. The Federal Government on Wednesday said investigations had shown that a Justice of the Supreme Court , Justice Sylvester Ngwuta , spent over N500 m between January and October 2016 despite his total annual legitimate earnings , including his allowances being N24 m .
This was disclosed in a document prepared by the prosecuting counsel, Mr . Charles Adeogun-Philips , summarising the case of the prosecution against the Justice of the Supreme Court , who was on November 21 , 2016 , arraigned before a Federal High Court in Abuja. During his arraignment , Ngwuta pleaded not guilty to 16 counts, including money laundering and others relating to fraudulent obtainment of multiple passports. The document , prepared in anticipation that the prosecution would be allowed to open its case on Wednesday, stated that the case brought against the judge , “ chronicles corrupt enrichment , violations of the money laundering laws of our land , passport fraud , and an attempt to obstruct justice by a judicial officer” . The prosecution alleged that from the N500 m , the apex court justice transferred dollar equivalent of N313 m cash in $ 100 bills to a building contractor within the period of nine months between January and September , 2016 , to “ develop several landed properties ” for him. It explained that earlier in 2015 , the defendant, within a period of one month , made various cash payments totalling $ 180 ,000 to the building contractor . peratives of the Department of State Services on October 7 , 2016 , total sums of N38 .358 m , $ 319 ,596 and £ 25 ,915 were found in his possession. The prosecuting lawyer also stated that he would lead evidence on how the defendant, on October 9 , 2016 , a day after being granted administrative bail by the DSS in Abuja , prevailed on a potential prosecution witness on the telephone to help him to move some bags containing title documents of landed assets and N27 m cash away from his house in Abakaliki , Ebonyi State . He also said the evidence to be led by the prosecution would reveal “ how the defendant, deliberately misled the Nigeria Immigration Service into issuing him four valid passports – two diplomatic and two standard Nigerian passports – having previously declared to the said service on oath that he had lost two of these passports” . “ The defendant was later found with all four passports during a search at his residence on October 7 , 2016 ,” the prosecution stated. The prosecution was scheduled to call its first set of witnesses against Justice Ngwuta on Wednesday, but the defendant, through his lawyer, Chief Kanu Agabi (SAN ), begged the trial judge , Justice John Tsoho, to further adjourn the case to afford him (Ngwuta ) more time to prepare for his defence . But ruling , Justice Tsoho agreed with the defence lawyer on the grounds that the provision of the constitution overrides the provision of the ACJA . The trial judge , Justice John Tsoho, adjourned till January 16 , 2017 , for the prosecution to start calling its witnesses.